President Obama’s 31 August statement about the Syrian crisis makes the best of a situation presenting him with only bad alternatives. Obama has never wanted to be drawn into the conflict and the American people are certainly not minded to go to war yet again in circumstances that most of them do not clearly understand, do not see as directly connected to any American interests, and that does not present any clear end. Therefore, the president has, in effect, punted. Saying that he will seek authorisation from Congress before committing US forces – while simultaneously ruling out American ‘boots on the ground’ – means that he is going to hand the decision over to representatives who are themselves sceptical of any more foreign adventures. But Obama says contradictory things: he insists that the US will respond with military force to the Assad regime’s alleged use of chemical weapons, but also wants authorisation from Congress. Can he have it both ways? If Congress withholds authorisation, will Obama still launch some military assault? If so, what purpose is Congress serving? Congress does not return from its summer recess until 9 September, but the debate will begin before legislators get back to their Capitol offices. How that debate will go – and how the president’s gambit of going to Congress for approval will play out – has yet to be seen. However, it does get Obama off the hook of having to do anything immediately about his ‘red line’ statements regarding Syria. For the Syrian regime’s part, it isn’t likely that Bashar al-Assad will see this move as particularly unsettling. This is the twenty-seventh in a series of posts that report on the state of the parties as measured by opinion polls. By pooling together all the available polling evidence we can reduce the impact of the random variation each individual survey inevitably produces. Most of the short term advances and setbacks in party polling fortunes are nothing more than random noise; the underlying trends – in which we are interested and which best assess the parties’ standings – are relatively stable and little influenced by day-to-day events. If there can ever be a definitive assessment of the parties’ standings, this is it. Further details of the method we use to build our estimates of public opinion can be found here. The big topic of national conversation over the past month has been the weather, with the hottest, driest conditions in recent memory. The political climate, however, has returned to normal. UKIP’s surge after the local elections has faded away – Nigel Farage and his party are no longer enjoying blanket media coverage as the press moves on to the traditional silly season fare of cyclists, cricketers, royal babies and expensive footballers. We now estimate UKIP support at 11.7%, down 1.1 points on last month and over 3 points on their June peak. This still leaves support for Farage’s party well above the levels seen at the start of the year, and well ahead of the Liberal Democrats in the battle for third place. 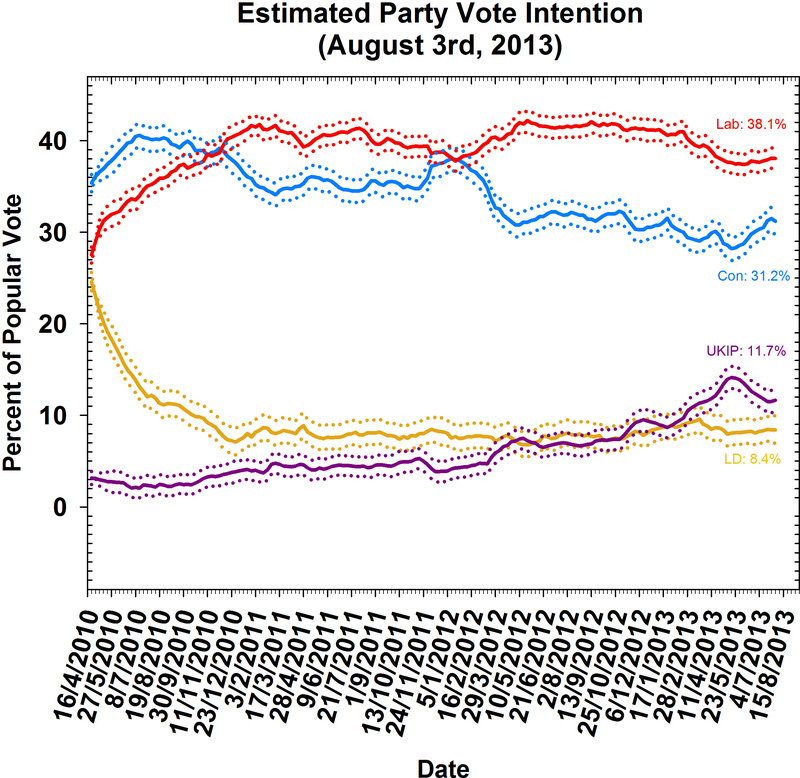 We estimate support for Clegg’s party at 8.4%, up 0.1 points on last month. UKIP’s surge was accompanied by a dip in support for the Conservatives, who have rebounded as the Eurosceptics have fallen back. This month we estimate Tory support at 31.2%, up a percentage point on last month and three points on their June low point. We cannot prove the link with aggregate data, but the mirror image pattern of UKIP and Conservative support in the past few months suggests the burst of publicity for Farage attracted the interest of disgruntled Tories who have drifted back to their traditional home as UKIP have fallen off the front page. This may be a worrying trend for Cameron given the near-certainty of renewed interest in UKIP next year as the European Parliament elections approach. The recovery in Conservative figures has, however, produced a swathe of negative headlines for Labour : “Labour’s lead tumbles after difficult month for Ed Miliband” (Independent, August 6th); “Labour’s shrinking poll lead increases party jitters” (New Statesman, 23rd July); “Where is Labour“? (politics.co.uk, 31st July); “Labour slips in the polls as Miliband aide admits party fears over next election” (Daily Mail, 6th August). Long time Miliband critic Dan Hodges went one further in the Telegraph, declaring “the next election is becoming Mr Cameron’s to lose” A casual reader of such articles would be forgiven for thinking that Labour had lost the support of a significant chunk of the electorate, and that this was somehow related to things the Labour leadership had said or done. Yet there is little evidence for either. In fact, our estimate, incorporating all the polling data, suggests Labour support is up half a point on last month, at 38.1%. The previous two months’ readings were almost identical: 38.4% in June, 37.7% in May. Labour have barely budged in our figures in four months. So why all the fuss? The problem seems to lie in two longstanding journalistic habits: the tendency to focus on poll leads, rather than shares, and to interpret the poll leads in terms of the prevailing Westminster Village narrative. Labour’s poll lead has indeed fallen, but as we have seen that is more down to the Conservative share recovering, which in turn is down to Tory voters who flirted with UKIP returning to the fold. The most likely explanation for the narrowing Labour poll lead therefore has nothing to do with anything Ed Miliband has said or done, but the dominant political narrative in recent weeks has been “Labour in crisis” following the public spat between Miliband and the leader of the Unite union Len McClusky over the unions’ role in Labour politics, and so journalists have framed the polling shift in these terms. The mistake journalists make in doing this is to assume that the average voter pays attention to the same issues they do. The union row which so excited the Westminster Village barely registered with voters. Less than a fifth of the members of McLusky’s own union could recognise the man at the centre of the row (many thought he was Sir Alex Ferguson); the figure among the general electorate is surely even lower. Voters seldom base their decisions on internal party feuds that they don’t understand or care about. It is therefore no surprise to anyone except the political media to see that Labour’s poll share has not budged at all in the wake of these supposedly toxic feuds. The underlying political equilibrium has barely changed in over a year: 35-40% of voters favour Labour, giving them a small but consistent lead over the Tories, who are settled in the low 30’s. This balance of forces won’t be shifted by funding fights, racist vans, NHS rows or any of the other emphemera that excite our columnists headline writers yet barely register with the average voter. Our fellow polling analyst Nate Silver has observed: that “most political pundits are completely useless”, and systematic research in the US suggests he is right. Readers looking for clues on the prospects for the main parties would be well advised to ignore the spin put on the polling by the professional tea-leaf readers in the op-ed section, and just focus on the data itself. The signals are there, but often all the pundits add is noise. We live in times of huge negativity about politics. When conversations between friends, family or colleagues turn to any issue relating to the government, MPs, councillors or town halls, we hear our government is no different from that of China, or the former East Germany. Politicians are incompetent; intrusive; absurd; or on the fiddle. At a time when so many billions of people worldwide are struggling desperately to win the wide range of democratic freedoms that people in the UK seem to mostly take for granted, can this outlook be justified? Politicians will always inspire anger in some quarters. They are elected to take decisions, and decisions can never please everybody. With a subject like press regulation, some people would prefer very light control; others strong. No politician could comply with both views. Democracy is designed to allow an open debate on issues such as these; the right to protest against decisions perceived to be mistaken; the independent enforcement of any laws passed; and ultimately, the right to decide whether or not to re-elect a politician or government which has acted in a certain way. And yet for every debate such as this, the general view seems to be that debate is not open; corporate influences trump public opinion; and politicians are unable or unwilling to take the right steps to sort it all out. This leads to people’s anger being aimed at the democratic system itself, with surveys showing that disengagement with democracy – as measured by benchmarks such as voter turnout or membership of political parties – is still on the rise. It follows that the best course of action is not to attack our system, but to appreciate its best parts, and try to improve the parts that are not so good, in as positive a way as possible. To break the negative spiral of low esteem for politicians and low esteem for the system, the only answer is for individuals to feel they are a bigger part of the system, by taking their own active steps to become more engaged with it. Starting local is one key: the same surveys that show people’s disengagement from politics always show that people feel they are closer to, and can have more effect on local and community decisions than national decisions. By volunteering for community organisations, helping the work of campaign groups including open debate with local politicians, or entering politics themselves, ‘us and them’ moves closer to the ‘us and us’ needed to overcome negativity. Another step in trying to change things for the better must be to try to understand more deeply how they work now, and that is where my new book ‘People power: a user’s guide to democracy’ is intended to help in some small, neutral and non-partisan way. Piece by piece, it looks at the components of our democracy, from elections to devolution, and local government to the freedom of the press; and how we can try to change things for the better. More broadly, this means improving our schools’ citizenship education – teaching children about how our democratic society works, from as young an age as possible. ‘Citizenship’ is already a core curriculum subject in secondary schools in England (age 11–16), and an optional subject in primary schools (age 5–11). Citizenship Studies is also available at GCSE and A-Level. Elsewhere in the UK the position varies, with Citizenship taught either as a cross-curriculum theme spanning several subjects (the basis in Scotland) or as part of a wider topic such as Personal and Social Education (as in Wales, and there is something similar in Northern Ireland). But its position in the curriculum is not high enough. For an issue that is so vital to the future health of our society, it needs to be viewed both as a subject in its own right and one which cuts across all other aspects of the curriculum, just like literacy and numeracy. It should also become a core subject from a younger age. Democratic institutions must undergo reform, too, to ensure they are as close as possible to the communities they serve. For one thing, they must become more representative: if there were more women, people from minority ethnic communities and people with disabilities in political office or positions of public leadership, more ordinary citizens would feel there was a place for people like them in politics and public service. Currently, these and many other groups of people are under-represented both in appointments to the boards of public bodies and in elected office. Disabled people, for example, make up only around 8 per cent of appointments to public boards, even though 14 per cent of the working-age population are disabled. Support and training for potential candidates, job-sharing or flexible working could all help to redress the balance, and again, these kinds of actions must be made a much higher priority. The need for action is urgent, and the time for action is now. There must be a cross-party push to improve British people’s understanding of how our political system works; how it has developed; why it is precious; and how everyone can get involved, if only in a small way, to strengthen and improve it. The alternative – more disengagement – is damaging not just to our own society but to a world more open to the possibilities of global democracy then it has ever been. After reading English Literature at Cambridge University, Dan became a journalist writing about the internet and other emerging technologies, and their effect on society, for publications including the Guardian and BBC Online. In 2001 he was co-founder of VoxPolitics, the UK’s first think-tank tracking the use of new technologies in political campaigning. This work led to Dan being voted in 2004 among the top 10 people worldwide having an impact on the way the internet is changing politics, at the World eDemocracy Forum in Paris. From 2006-11, Dan worked for the Parliamentary IT Committee (PITCOM), briefing MPs and Peers on key policy issues such as the role of the Internet in the Arab Spring. From 2006-09 he was on the international board of E-Democracy.Org, a charity boosting democratic participation using information networks. He is co-founder of Headstar, a publishing house specialising in technology and social issues. Dan’s new book “People Power: A user’s guide to democracy in the UK” is published by Transworld (ISBN-13: 978-0593070505). Speak to many University colleagues and they will report what appears to be a common experience: evidence carefully collected and assembled about significant societal concerns, and what to do about them, are presented to policy makers and then promptly ignored. How can this frustrating process best be understood? The dozen explanations I offer are less to do with the political process being corrupt and have more to do with its complexities which academics from all disciplines need to understand and respect. One common rationalization offered by those that suffer the experience of being de facto ignored (notwithstanding some lip service that might be paid to the importance of evidence especially if the work is commissioned by policy makers) is that policy makers, especially politicians are driven by perverse incentives that lead them to embrace ignorance rather than the insight offered by the knowledge and wisdom of my University colleagues. Politicians, I am told, have short-term desires to get re-elected and advance their careers, so evidence matters little save what it delivers on those fronts. Explanation number 1 is often shortly followed by a second disparaging swipe. Politicians are beholden to powerful interests that can substitute their self-serving claims into the policy process, washing away the impact of more rigorously and transparently scrutinised evidence produced within academia. There are times when these two cynical traits are in play and explain the “listening but listening policymakers” phenomena. But I want to argue there are other factors more often at work that reflect less the perversity of politics and more its complexity. The good news is that these factors can be ameliorated to some degree by the way that academics behave. For that reason fatalism about politics in response to the experience of appearing to be ignored should be tempered by a better understanding of how politics works. There are 10 movable obstacles (MOs let’s call them) to add to the two more depressing blockages usually identified, giving me my dozen factors. MO1: A primary question for the policymaker is: why should I pay attention to this issue rather than many others? When academics enter the policy process they naturally assume that process started when they entered but of course it didn’t. There are only limited windows of opportunity when an issue become sufficiently pressing to encourage a focus on it. Understanding the rhythms of policy making around manifestos, big speeches, set piece agenda setting opportunities around the budget or the Queen’s Speech or other much more low-key developments can help with getting the timing of the intervention right. Part of the art of having an impact is being in the right place at the right time and then, of course, being able to go when the opportunity presents itself. MO2: Policymakers will sometimes say and often think: bring me solutions not just problems. Academic research is often more focused on identifying an issue of concern and its dynamics rather than focusing on potential actions or interventions (they may get mentioned in the last paragraph of a report). Explanation of what is plainly central to what we do but academics could perhaps do more to take on the challenge of designing solutions. There remains an issue still in that academics often couch their arguments in terms of the limits of the evidence and policymakers might in turn seek a more definitive position. Again this concern is not an insurmountable and one response is for the academic to take the position of “honest broker” laying out options and choices for the policy maker. For some good reflections on this point see here. MO3: If an intervention is identified that should work it is still subject to challenge about its administrative, financial and political feasibility? The question for policymakers is not can it be done but rather can it be done by government? Showing that a policy response proposed is right (a solution to the identified problem) is only half that battle, if that. For the policymaker it’s not what works that matters; it’s what’s feasible that matters. Can the challenges of administration, resourcing and political support and ownership be met? When academics step into the world of policymaking they should be sensitive and as informed as possible about these challenges; avoid giving the appearance of naivety, this is not a strong selling point when trying to persuade. MO4: The question for the policymaker is not simply-do I support this policy- but rather how much energy and political capital would I have to expend to make the policy win through against opposition from other sources? Policymakers know that there are only a limited number of things they can realistically achieve and they may have other more pressing priorities. Picking the policymaker both able and willing to run with a policy is by no means easy but academics need to be aware of this factor in the policymaking process and think clearly about how to make the policy appear doable. MO5: Let’s say that a cadre of policymakers buy the idea of doing something but their enthusiasm then gets tested in the wider arena of policymaking. They have to show not only that the policy will beat the problem, that it is feasible and doable but that it can also win in response to the “opportunity costs” question? The policymaker will be asked: if we spend time, money and effort on this proposal what are we not going to be doing that we should have already been doing? Policy is a competition for time in a very time poor environment. There are many issues and so little time; academics know that about their research activities so need to remember that it applies with even more force in the world of policy. MO6: Networks matter in research and they matter in policymaking as well. It’s not normal for ideas from an unknown source to be easily embraced and this is true for many areas of life. Politicians and policymakers, in particular, have survived in their careers by being suspicious to some degree. They will always ask in their heads at least: are you selling me a pup? Policymaking does rely to a large extent on trust in source and status in network so academics need to build both their trust and status if they want to be taken seriously. Years or decades even of non-engagement, followed by a sudden step on to the policy stage proclaiming solutions, is an unlikely formula for success. MO7: In some ways the point is so obvious that it’s amazing how often it gets overlooked: politicians and other policymakers believe in things. They have preferences, philosophical positions (some more coherent than others) and even ideologies about what the world should be and how it should be changed: that is both ends and means are political choices. Therefore values matter in the policy process alongside evidence. The “what works” rhetoric can imply that choices are entirely technical but nothing could be further from reality in democratic policymaking. Choice is about whether a policy matches the chooser’s desired means and goals and understanding that is essential for all academics and democrats. Moreover academics are not immune from having values, preferences and ideologies and though we try to guard against their impact on our research there is no denying that they can have an impact especially on what we choose to research and the manner in which that research is presented. MO8: Nothing is certain and a policy can be killed by fear of unintended consequences. The probabilities suggest- the language of much scientific discourse- may not be strong enough to stop a wave of fear about unintended consequences. Academics rightly want to be clear about the limits of the evidence but they should also be keen to pre-identify and try to undermine spurious objections to their findings. Opponents of any measure tend to frame their arguments along standard lines: it will not achieve the desired effect or worse it will have perverse effects or worse still it will jeopardised much cherished other gains. Understanding how interventions are going to be challenged should be something that academics should be aware of when they engage. MO9: If you have got this far in the blog you might be feeling a little depressed. Here is my attempt to cheer you up. All the previously mentioned obstacles can be overcome and your research could indeed lead to a policy intervention; only for implementation failure to undermine it. OK maybe I need to work on my skills for relieving depression but the key point is that the implementation concern is one that if addressed can be met as well. But it needs to be addressed. The forces of opposition to a policy do not stop once it’s adopted. MO10: “Events, dear boy, events” is an alleged explanation that former British PM Harold Macmillan offered as to why achieving anything in politics is so difficult. The unpredictable, sudden crisis can blow a carefully evidenced and prepared policy process of course. Just as in nature where we learning that changes in woods/forests, for example, are driven by as much by major events as slow environmental change so it is in politics that all that appeared solid and definite can suddenly melt and become an arena of uncertainty. There are many coping strategies to deal with this phenomenon but they all boil down to: if at first you do not succeed then try and try again. Well that’s the dozen reasons for the gaping hole that often exists between evidence from academia and the policy process. Let’s make it a baker’s dozen by reminding ourselves that occasionally the problem is that academics communicate their insights with such a level of jargon, complexity and extreme length that no policymaker, even the most willing, could be persuaded to take the ideas seriously. I hope that I have avoided unclear terminology but I am aware this post has taking up a lot of space. And that seems a good point at which to stop. Professor Gerry Stoker is a Professor of Governance, Director of the Centre for Citizenship, Globalization and Governance and Director of Public Policy@Southampton.